Are the waters of Gaia still azure? The music of the earth, that which is devoted to the sea, the source of life. What was the first sound that man felt? It was the caressing sound of “water” . And it was the thump of the "heart". Through the sound of water, the harmony of the beginning is heard. The sound of the water is gentle, like the sea. The earth, as well, is gentle. Search for one who may co-exist with nature. 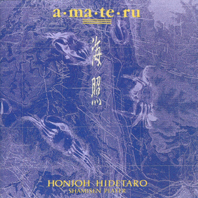 Honjoh Hidetaro is one of the few composers and Shamisen musicians who can convey the Japanese desire to pursue of music known as Japanese folk music. As a new stream of folk song in Japan, he learns from the past again and with a new way, expresses a singing voice and the energy of the people that Japanese folk song possess. "a ma te ru" given up to the "Sea" (the origin of life) as a straight offering is self-proclaimed masterpiece album which was made through the help and collaboration of other various musicians.